Clinton Darryl "Clint" Mansell (/ˈmænsəl/; born 7 January 1963) is an English musician, composer, and former lead singer of the band Pop Will Eat Itself. After Pop Will Eat Itself disbanded in 1996, Mansell was introduced to film scoring when director Darren Aronofsky hired him to score his debut film, Pi. Mansell then wrote the score for Aronofsky's next film, Requiem for a Dream, which has been well received. The film's primary composition "Lux Aeterna" has become extremely popular, appearing in a variety of advertisements, film trailers and YouTube videos being branded as Epic Music. His notable film scores include Pi, The Fountain, Moon, Smokin' Aces, Requiem for a Dream, The Wrestler, Doom, Black Swan, and High-Rise. Mansell was the lead singer and guitarist of Pop Will Eat Itself. When PWEI signed to Nothing Records, Mansell became close friends with Trent Reznor of Nine Inch Nails, and he performed backing vocals on the 1999 album The Fragile. Mansell's score for Darren Aronofsky's π was followed up by his score for Aronofsky's next film, Requiem for a Dream, which became a cult hit. Since their first collaboration in 1996, Mansell has composed the music to every Aronofsky film. The trailer for The Lord of the Rings: The Two Towers contained a re-arranged version of the track "Lux Aeterna", using a full orchestra and choir. 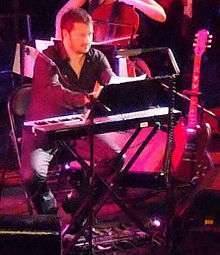 The piece, named "Requiem for a Tower", was recorded especially for the trailer. The orchestration was arranged by Simone Benyacar, Dan Nielsen, and Veigar Margeirsson. "Lux Aeterna" has since become popular, with both the original and the "Requiem for a Tower" version having appeared in a wide variety of advertisements and trailers, including the trailer for the Red Sox–Yankees games in the 2007 Major League Baseball season, and trailers for the films Zathura, The Da Vinci Code, Sunshine, Babylon A.D. and the TV series Lost and Top Gear. It was also used on Sky Sports News and as the theme for Soccer Saturday from 2007–2009. In 2006, the theme was used in EuroSport LIVE trailers. The theme was also used by America's Got Talent as an introduction of the judges before being changed slightly. The new variant is now a regular piece on the show. Mansell's theme tune for science-fiction movie Moon also appears on the trailer for the film The Iron Lady and computer game Aliens: Colonial Marines. 2010 Faster George Tillman, Jr.
1 2 3 4 "Requiem for a Tower Dream by Various Artists on Apple Music". Retrieved 30 November 2016. ↑ 64th Golden Globe Awards nominations Archived 14 May 2007 at the Wayback Machine. ↑ "Streama Film - Allt Om Laglig Streaming TV & Film Online". Retrieved 30 November 2016. ↑ IGN (27 January 2012). "Exclusive Aliens: Colonial Marines Cinematic Trailer". Retrieved 30 November 2016 – via YouTube.